Music brings us joy, podcasts broaden our worldview, radio broadcasts keep us informed about the world around us. When partaking of these important auditory presentations, the last thing you want to worry about is the quality of your earbuds. At Comply™ Foam we believe that the best Earphone Foam Tips are those that can’t even be detected while you’re listening to your favorite audio. Here at Comply™, we’re obsessed with comfort, form, function, and feature. Our expert sound technicians have spent years crafting the ultimate in-ear upgrade. With the Comfort 600 Foam Ear Tips, your ears won’t itch or be sore at the end of your listening session. Whether you listen for eight minutes or eight hours, we guarantee that your music’s sound quality won’t diminish nor will your ears become fatigued. Audiophiles, music lovers, and audiobook enthusiasts alike are sure to enjoy the comfort and sound quality of the Comfort 600 Foam Tips. The Comfort Series (Ts) Foam Tips have been specially designed for all day use and comfort. These revolutionary new earbuds are perfect for those who pull long hours at the office or who have long commutes. The Comfort Series Foam Tips have been designed for added comfort. All Comply™ Foam tips are comfortable, but these Tips have a spherical shape to reduce the amount of pressure on your ear canal. If in-ear headphones hurt your ears over long listening sessions, then Comfort Tips are for you. Comfort 600 Foam Tips offer listeners the best of the best. With Maximum Earphone Comfort, External Noise Isolation, a Superior Audio Experience, Secure In-Ear Fit, and WaxGuard™ Protection you won’t find another pair of Earphone Tips that live up to the Comply™ Foam standard. Best for: Commuters and travelers, audiophiles, music-enthusiasts, and office workers. Listen at work, hear music on a plane. Maximum Earphone Comfort: Comfort 600 Foam Tips utilize the Comply™ Foam proprietary foam blend that is 30 times softer than silicone. With an original design, the Comfort 600 Foam Tips will funnel sound directly into your inner ear canal which will result in a fuller, more robust sound quality. The round shape of the Comfort 600 Foam Tips was chosen due to its ability to produce less ear canal contact, ensuring comfort over long listening sessions. It is this unique shape partnered with body-heat activated memory foam that creates an ultra-soft, comfortable listening experience. External Noise Isolation: When you’re enjoying your favorite podcasts, audio books, or albums, the last thing you want to hear is a screaming baby or honking horn - that’s why the Comfort 600 Foam Tips have been crafted with the best external noise isolation technology available. These Foam Tips react with the heat generated by your body to create a custom ear canal seal that will keep your headphones in place without causing ear fatigue or irritation. By using Comply™ Foam external noise isolation technology, our Foam Tips provide 2x more dB reduction than standard silicone ear tips. Superior Audio Experience: With a perfect ear canal seal, Comply™ Tips funnel pure sound directly into the ear. You’ll experience a maximized listening experience with enhanced bass and crisp vocals. Hear music how it is supposed to be heard with all its highs and lows. Once you’ve tried the Comfort 600 Foam Tips, you’ll never go back to your old headphones again. Secure In-Ear Fit: The Comply™ Foam proprietary memory foam blend used in the Comfort 600 Foam Tips expands to fill the unique shape of your ear canal, creating a custom, snug fit to dramatically increase in-ear retention. Whether you’re killing it on the track or in the office, we guarantee that your Comfort 600 Foam Tips will stay in place - no matter what. 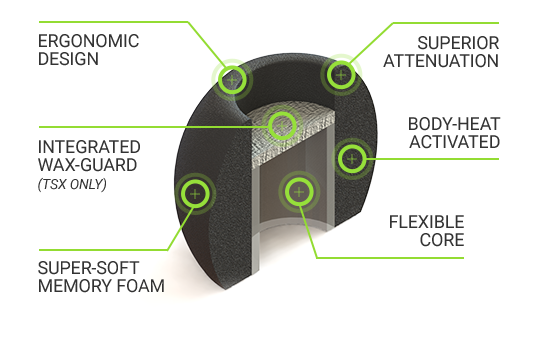 WaxGuard™ option not available on the Comfort 600.